I know this may sound weird to some people, but in the summer here (in the ghetto, sorry I don't know a better way to refer to this corn) it is sold out of large tubs in grocery carts in the streets. 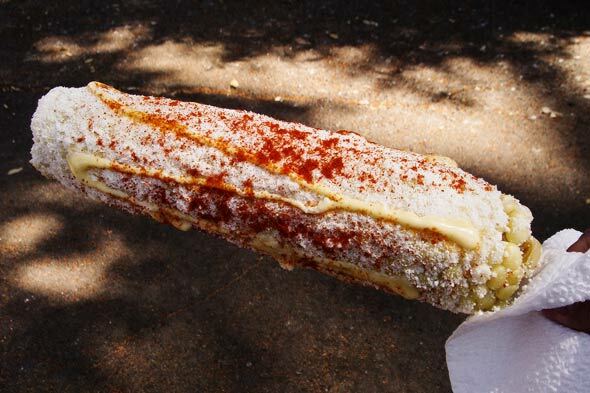 Basically the original version is cooked corn on a cob slathered with mayonnaise (or butter, depending on the vendor), covered with parmesan cheese, and sprinkled with cayenne pepper. So last night, trying to think of something to eat with my black bean enchilada casserole I came up with this vegan version of the original. It turned out so well leftovers are in my bento today. I just heat the corn through with the hot sauce and add the nutritional yeast at the end. After it is off the heat (preferably just before you are going to eat) mix the mayonnaise in. If you are okay with egg and cheese and you are not on a diet I would suggest trying the original, especially during the summer with fresh corn. But there is a warning, this is extremely addictive and I have know people to put on a fair amount of weight from this (I had a boss that put on 20 lb. in one summer, but in all fairness she ate a ton of it). They sell something like this at street fairs and festivals here. No mayo, just butter, parmigiana and/or chili powder or cayenne. It's really good,but I never heard it called that. I think they call it Roasted-corn-on-a-stick, or just Corn-on-a-stick. Love that food on a stick! lol! I like your version, I'll have to try it. Try fresh lime with Chili powder and garlic salt sprinkled on it. OH MY SOUL! It's delicious. That is how mango is sold on the street, minus the garlic. But I agree it is a very yummy combination. This is probably a silly question but I have never heard of nutritional yeast. Would normal yeast do the same job or is it something completely different? It is different. It is a vegan stand in for Parmesan cheese in this case. I usually get it from the health food store. But if you eat dairy products, the cheese works just as well. I have a link below, if you want a bit more of a description. This is corn "a la Tijuanense" -- basically Tijuana-style corn, which is sold by street vendors in Tijuana and throughout Mexico. If you've seen the movie "Nacho Libre" you'll easily recognize it. One of our local taco shops does this with niblets (from a can, I think, since they serve it year-round) as a side dish. It is pretty tasty! To be honest I "LOL" @ the "ghetto", that was quite funny! I don't know if this is what you are reffering to? Because I have heard it been called a lot of different things before, but mostly in "barrio" in Mexico, USA they call it "Elote en Palo o Vaso". You can either have it in a cup or stick. Boiled corn (frozen is best), Helmsman's/McCormick mayonesa (mayonnaise), squirt butter and red chile powder. I found a fabulous recipe in an Indian cookbook and it's now my favourite way to do corn. I have it a couple of times a week during the summer. Apparently it's a traditional street food in some parts of India.